When you do it right, a conservatory can be the most special room in your house. A conservatory is a unique space where outdoors meets in; where nature meets design. It can,and should, be so much more than just a living room with glass walls. 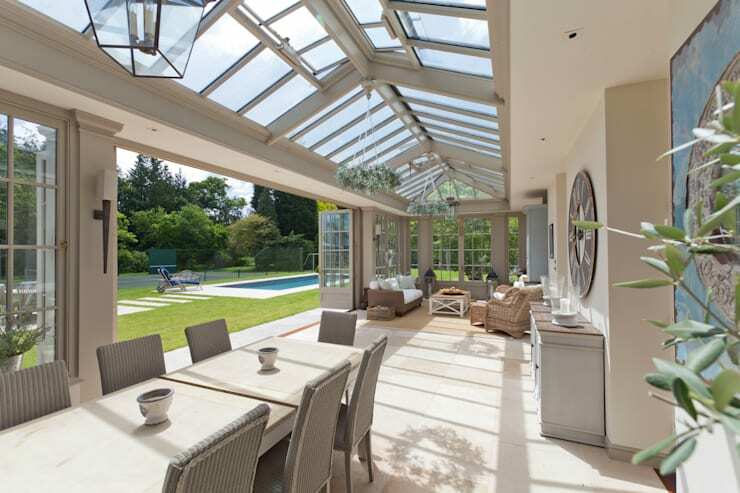 You may have space for a conservatory but are hesitant because you don’t want to reduce your outdoor space. However, there is no reason why you can’t incorporate garden elements into your conservatory, as some of these designs will show. Your conservatory will be the sunniest room in your home, so here’s some inspiration on how to make it the happiest as well. Is it a conservatory? Is it a greenhouse? It could be either, or it could be both, but it’s lovely either way. 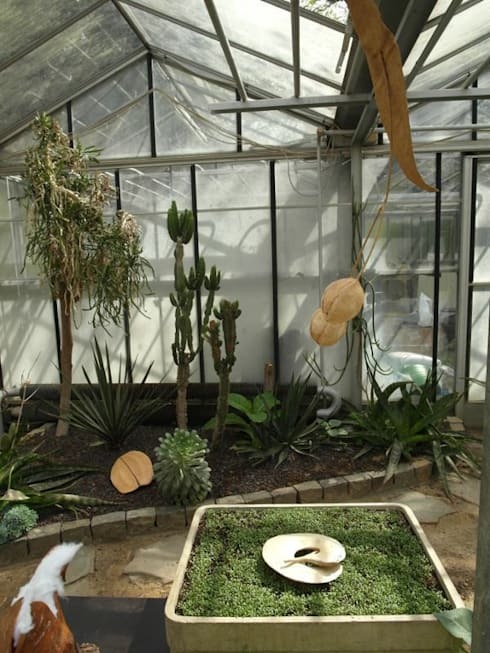 By mixing sculptural elements with desert-themed greenery, this designer has created a strange but wonderful room. Remember, there is no reason why you can’t actually plant things in your conservatory, as shown here, and doing so doesn’t mean you have to sacrifice the indoor aspects of the room. You can easily combine a sofa or a table and chairs with horticultural features like these. Obviously one of the functions of a conservatory is to diminish the distance between the inside of your home and the great outdoors, and all that glass does a great job of achieving that. But you can go even further and include doors or walls that slide or fold all the way back, leaving the inside of your conservatory completely open. The image here is a great example – just imagine how perfect lunch around that table would be. The appeal of this design lies in its sheer simplicity and rough-and-ready charm. Again it features windows that can be completely opened for the sense of being simultaneously indoors and out, and to enhance this effect no effort has been made to decorate the conservatory itself in the manner of an interior room. The unpainted brick walls of the house remain, adding an edge of the industrial. If there was such a thing as a party conservatory, then this would be the perfect example. It seems to be made for drinking and dining on summer evenings – and maybe for watching sports too (note the widescreen TV hiding at the back). This design is quite unlike the others so far in that it makes no attempt to bring the garden into the house. In fact, it isn’t even a conservatory in the strictest sense, as it isn’t a complete room. Instead it’s a light-giving extension to an existing room. 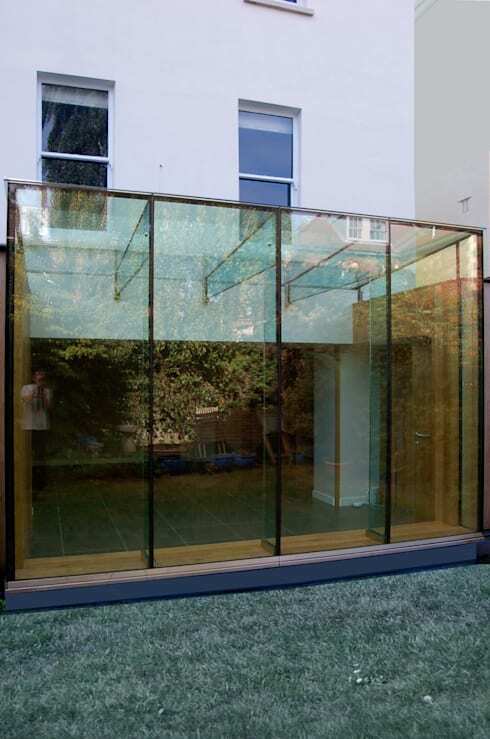 With this much added glass, the room must be absolutely flooded with light on a sunny day. Not only that, but the straight lines and pleasingly simple structure of the conservatory area are beautiful seen from the outside too. It’s sweet, it’s uncomplicated, and on the right day we can imagine it’s absolutely glorious to stand inside. Or at least in a conservatory you can’t. It’s always going to be an extremely bright room, so going all out and emphasising that with white textiles and flooring is usually a good choice. This room also uses dashes of black to keep things from getting too boring. It’s a very classic (and classy) look and one that’s perfect for this type of space. 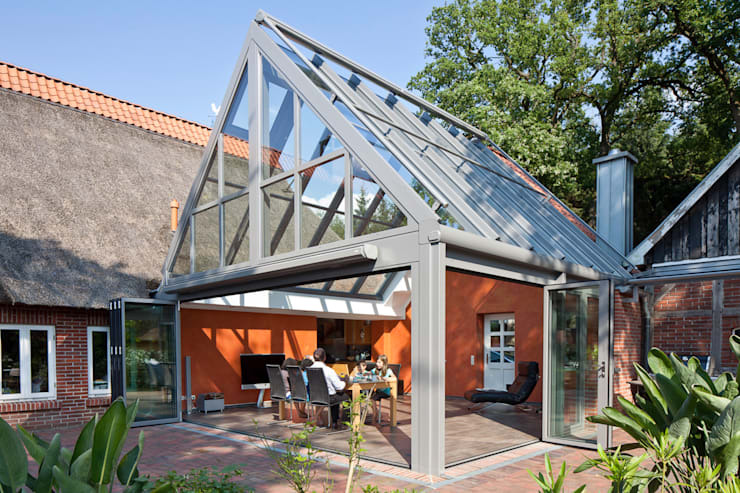 Which of these conservatory designs would you transport to your own home, if you could?